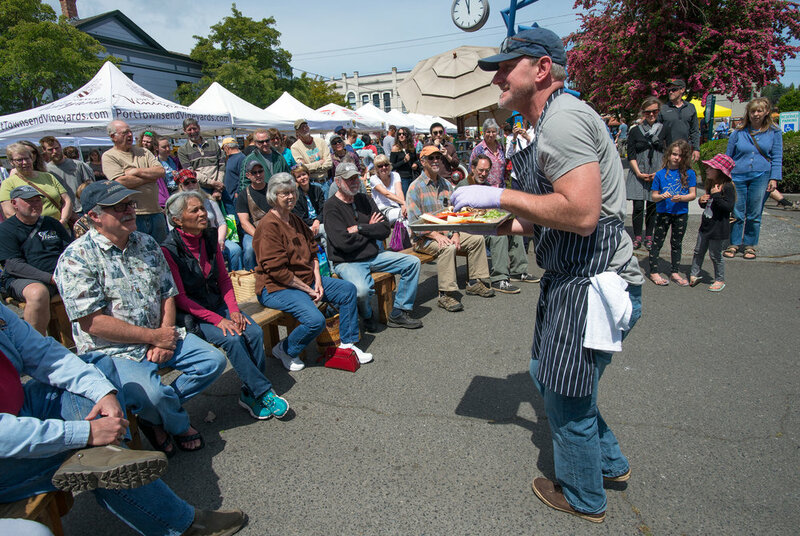 Join us in celebrating farm-fresh and artisan food at the 7th annual Port Townsend Artisan Food Festival on Saturday, May 25th at the Port Townsend Farmers Market, 9am-2pm, Tyler Street. This event features cooking demonstrations by local chefs; and cheese, hard cider and wine tastings with award-winning Mt. Townsend Creamery, Finnriver Cidery, Eaglemount Wine and Cider, and Port Townsend Vineyards. This family-friendly event also includes kids’ activities, shopping at our vibrant farmers market and more! Arran Stark, Artisan Food Fest 2018. Photo by David Conklin. Local food enthusiast, chef, and educator Arran Stark has given Jefferson Healthcare food services an extreme nutrition makeover. A native of Georgia, Arran Stark, Executiave Chef at Jefferson Healthcare, has served in the kitchens of some of the nation’s most prestigious restaurants and institutions, including the Museum of Fine Arts in Boston, Massachusetts. For more than 12 years, Chef Stark and his wife, Micaela Colley, have called Port Townsend home. Upon relocating to the Peninsula, he operated Brassica restaurant at Sweet Laurette’s and continues to manage his own catering company, Cultivated Palette. Following the birth of his second child, son Owyn, however, Chef Stark brought his culinary skills and affinity for fresh, local produce to the kitchens of Jefferson Healthcare. Since joining the Jefferson Healthcare team, Chef Stark has revitalized the hospital’s dining options, offering patients and their families delicious, nutritious meals featuring the best fruits and vegetables the area has to offer. In addition to running the culinary show at Jefferson Healthcare, Chef Stark hosts cooking classes at the Port Townsend Farmers Market and at the Cultivated Palette kitchen in Port Townsend. Community chef, recipe developer, and educator Sidonie Maroon teaches international foodways classes for the Port Townsend Food Coop. Born and raised in Southern Oregon, Sidonie shares her creativity and cooking expertise with everyone she meets. Never aspiring to be a restaurant chef, she instead flourishes in her kitchen laboratory where she cooks, blogs, and develops original recipes. A professional teacher, Sidonie has taught adults and youth in Jefferson county for 25 years. Twelve years ago, she founded F.E.A.S.T. (foodways education at a sustainable table) as the business platform for her cooking classes, culinary mentoring and Folk Art and Food Camps. The depth and breadth of her knowledge, coupled with her unpretentious approach make her a popular teacher. At the heart of her cooking practice is a dedication to start from scratch and build technique from traditional world food wisdoms. She was artisan long before it was popular: gardening, foraging, working on organic farms, living off-grid, preserving, fermenting and baking from scratch. You can find her recipes, classes, column and blog posts on the Food Coop’s website https://www.foodcoop.coop or her personal blog https://www.abluedotkitchen.com. The Port Townsend Farmers Market is pleased to bring you food-focused kids activities. We will host vegetable print making as well as some other activities on the Port Townsend Community Center grass. Vegetable print making, Artisan Food Festival, 2019. Photo by David Conklin. Visiting vendor, Johnson & Gunstone Shellfish will serve raw shucked oysters, BBQ'd oysters, fried oysters/clams, and a steamed clam dish, as well as sell fresh clams and oysters. Johnson & Gunstone Shellfish is a 5th generation family farm, which has been in operation for 101 years! Based out of Discovery Bay, they harvest from a variety of shellfish farms across the Olympic Peninsula and Hood Canal. They harvest a variety of shellfish products, mainly clams and oysters. They participated in the Port Townsend Farmers Market last season and are joining us as a special guest for Artisan Food Festival 2019. Mt. Townsend Creamery is hosting a cheese paring for Artisan Food Festival. Award winning, Mt. Townsend Creamery makes delicious artisan cheese. "We love what we do, and we are proud to create products that reflect the flavor of our landscape. We passionately educate and inspire our customers to understand and appreciate cheese culture. We strive to operate in a sustainable fashion from an environmental, social and financial perspective. Learn more! Port Townsend Vineyards is participating in Artisan Food Festival as a visiting vendor. They opened their doors doors last year offering a five-zone vineyard cultivated to showcase the grape varieties that thrive in our geography and coastal climate. Learn more!